Traditionally, on May 5th, people celebrate the “Tango-no Sekku” for boys in Japan. 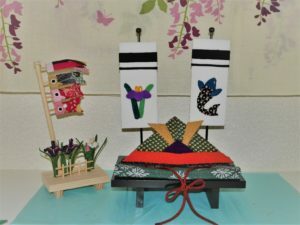 Boy’s parents display “koi-nobori” (carp-shaped streamer) and “Gogatsu-ningyo” (a miniature set of samurai warrior doll) to wish for their son to grow up strong and healthy. 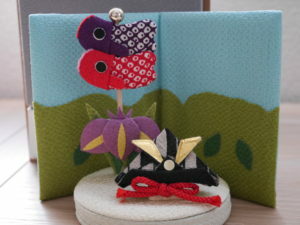 But now, it called “Kodomo-no-hi” (Children’s day) and cerebrate for all children. On that day, people eat special dishes with their family. Sushi is one of the most famous dish. There are some kinds of sushi like “nigiri-zushi” (hand-shaped sushi), “maki-zushi” (rolled sushi) and so on…. Do you know a kind of sushi called “temaki-zushi”? It looks similar to maki-zushi but it is the home style sushi which you have to make sushi roll before eating. You can enjoy choosing your own combination of ingredients of the roll. Mix the seasonings (vinegar, sugar, salt) well. Put the rice in the ball. Fold in the rice and pour the mixed seasoning. Fan it and let it cool. Put eggs and seasonings in the ball and mix them. Heat the pan and put 1/4 of egg mixture into it. When the bottom of the egg is brown, start rolling it from the front side of the pan to the back. Repeat this process three more times. 3. Cut sashimi or cucumber, or the ingredients you like into rectangles to dish up on a plate. 4. Put some rice on the half of the nori sheet. Then, put the ingredients you like on it. 5. Roll it up into a corn shape. Remember, roll it from the side which the stuffs are on.